Here is a picture of thr Administrative Complex in Verrettes that burned down. 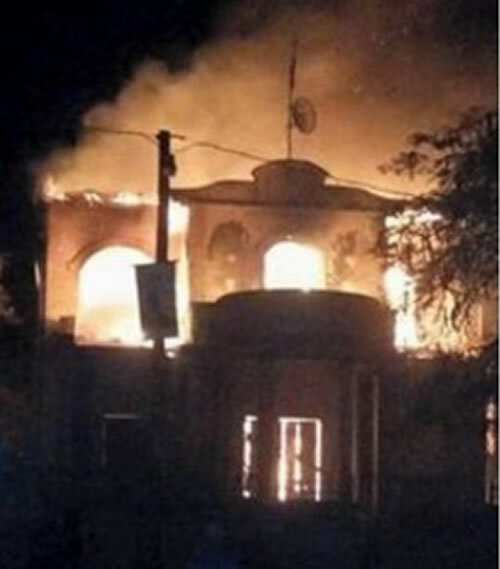 On January 27, 2016, a group of protesters set fire to the Administrative complex of Verrettes. It is a complex where along with several other government offices, the office of BEC (Communal Electoral Offices), a wing of the BED (Bureau Electoral Départemental) is located. BED is a decentralized body of the CEP (Provisional Electoral Council). BED executes the operational plan of CEP through the actions of BEC under its dependence. Verrettes is a commune in the Saint-Marc Arrondissement, in the Artibonite Department. It is an uneventful, peaceful city which had remained unaffected so far by Haiti's political turmoil. The fire was deliberately set by some unknown assailants on the night of January 27th.